I participated in a little birthday swap this year, and this was my cupcake creation. It is made from a couple pieces of felted sweaters (the bottom was the cuff of a sleeve). 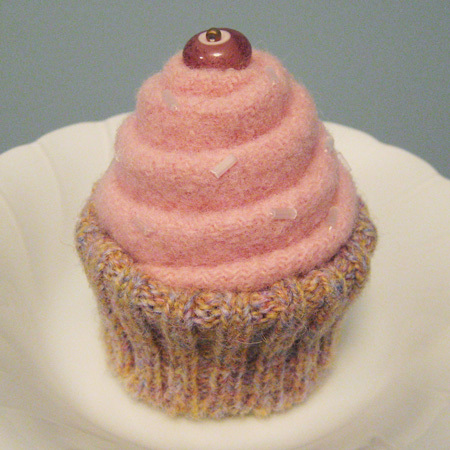 The "cherry" on top is one of my lampwork beads that was just waiting for a purpose. Then, after adding a few bugle bead "sprinkles", she was done! Luckily my birthday falls early in the year and I didn't have to wait very long to "exchange" gifts. 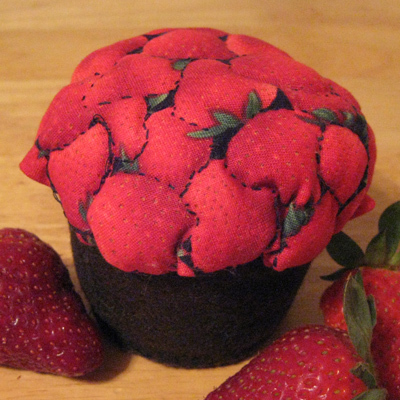 I got this fun strawberry & chocolate cupcake...isn't it yummy!